I recently finished reading Purple Hibiscus. emotions in me. Not good ones though. It's why I'm reluctant to recommend it. 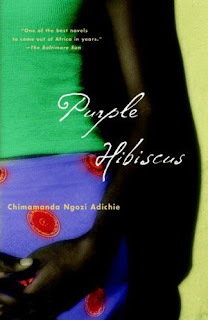 Adichie is clearly very talented all the same. Here in a particularly emotional state, I don't want to say very much. Blogs are funny things because they can become the canvas one only pours their heart out onto when they are feeling particularly emotionally charged. Every post can become a memoir of angst and sorrows, half-reflections and musings about a fleeting interest. Because that's when you want to say things, isn't it? When you feel things. Writing a blog post is like therapy. My posts feel unnaturally rigid in that respect. The emotion written and dispensed in measured doses. I give myself the opportunity to pour out onto the page, but then I want to reflect too before I click Publish. And it's as I do this, that I cut things back. I refocus a little. I get a better sense of what's happening and of what matters. I organise my thoughts into something coherent. My medicine degree is nearly over. I am exhausted. I am not enjoying it as much as I thought I would. I am ready to stop. At the same time, I am so grateful. I have been given a great gift, to be doing what I do. My lot is a worthwhile lot. And medicine is not the only thing that matters. I hope I come to appreciate these truths more and more throughout my life.